Home / brawling / ebon jaguar / geometry / Rak's Comments — "Why exactly CAN'T the Ebon Jag Brawl?" Rak's Comments — "Why exactly CAN'T the Ebon Jag Brawl?" MechWarrior Nehkrosis asked this question on Reddit today. This is a recurring question ever since the Stalker days so I was prepared. The Ebon Jaguar has everything going for it to brawl if you look at the hardpoints. Though, it rarely makes sense. The answer in my case is similar to why people brawl so rarely with Stalkers. Those things can have 5 missiles and 5 energy hardpoints and reach almost 100 firepower while packing tons of ammo and heatsinks. Yes its low speed is a factor too, but I think the answer to your question is geometry. The Ebon Jaguar has a Stalkeresque nose geometry, while also having a very wide body. As such, it has a lot of problems managing the incoming damage. 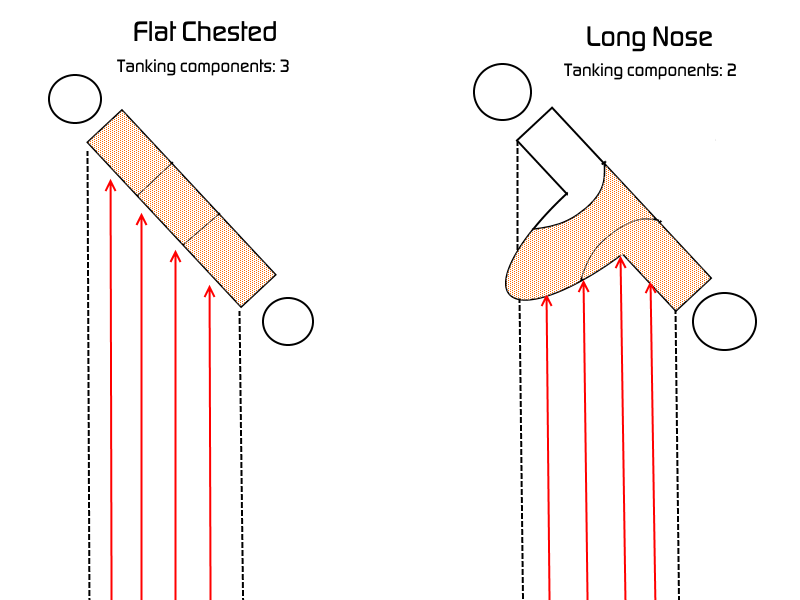 The nose geometry should allow it to tank better at range, but as soon as someone gets an angle on you, the STs start tanking unproportionally and pop easily. Coincidentally brawling is where you can't control how you take damage. Usually you're being shot at by multiple enemies and from unexpected angles. Therefore a brawling EBJ will pop sides very quickly in a brawling situation. Torso twisting actually hurts you a lot as you direct all incoming damage to a single ST that way. Compare it with flat chested 'Mechs like the Cataphract. When you twist or receive damage from unexpected angles, it will still spread between all three of your side torsos and you will survive longer. Even more if you include arms (and legs if you use JJs). I illustrated my the point I'm trying to make here. So when an EBJ brawls its sides inevitably pop very early and it dies before it has a chance to use its CT health pool. TBR also suffers a similar fate, but its ridiculous mobility, 75-tonner armor and slightly better hitboxes help it do a bit better. 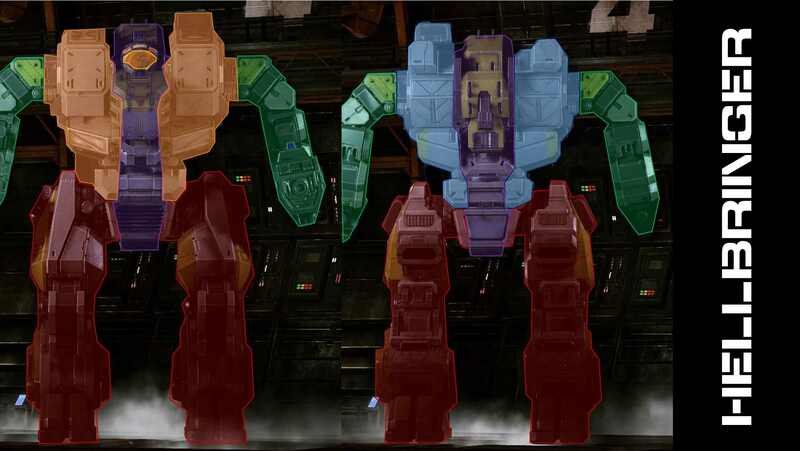 That is also why people opt for one-sided builds on these long-nosed 'Mechs since once you let a side pop on purpose, it becomes a huge 50% damage reduction wall. Now there's the question, "Why not a Hellbringer then? Why don't people brawl with a HBR?" and it'd be a very valid question since the HBR is a humanoid and has a relatively flat chest. In its case, the HBR has huge ST hitboxes. 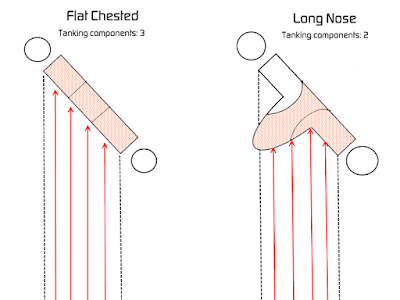 It's very hard to let CT tank since damage inevitably spreads between two STs. Since with Clan XLs the death comes from the destruction of two STs, the HBR essentially suffers the same fate. Its STs fall before its CT health pool is depleted. If you want a Clan brawler, head straight for the Summoner. It will tank like a beast and will be stupid mobile, but unfortunately it has problems outputting damage compared to 65 or 75 tonners.